Thanks for the information. I had no idea that such a thing even exists and I still use usual paper cards or just send someone my profile and that’s all. It can be much easier for me to work with cards after installing the app. Just one quick thing to note: There is no need to write “@DiNaRa” at the start of the comment, as all you really need to do is hit the Reply button underneath the comment you are replying to. Thanks for the heads-up mate 🙂 din’t notice it. This is a good and even a really useful application but i have an Android phone so, i wait for Android developers to come with a similar app to try it. I read below and avoided the “chris” but I missed the “h” ! Will keep in mind for the next comments. That’s okay Sam, I suppose a misspelling is better than the wrong name! 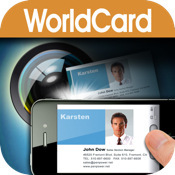 I did not mention it in the review, but the app is available in Android too, check it out at http://market.android.com/details?id=com.penpower.bcr.worldcard. Thanks for sharing it Ron. I also have Android and I was searching for an application like this. Everything is going paperless now. The big piece of A4 sized document had been constantly advised to digitized it and keep it as a safe copy for environment friendly sake. Now even name cards are kept as soft copy. If the application can send own name card to your customer during some meeting or presentation, then we don’t have to say “Aiks, I left my name cards in the office” when we forgot to bring one. Yes it seems that almost most of the things are going paperless today. I remember the days when I used to visit the local center for applying a job and the guy in the desk had a huge pile of applications sitting pretty. The idea without paper is great, as we are going to take care of the enviroment. I have heard about the app, but I have never used it before. I think I need to use it. Yes most of the things are going paperless today, but we got to be careful that the hardware that these technology are built-on are too recycled in an environment friendly way. And, yes you got to try the app out. Great review chris. I guess an accuracy of 80% is not bad for a start. Piles of business card holders can finally be converted into digital form using minimal effort. By interfacing this technology with the internet, you could click a photo of some text and google could find stuff related to the text and show it to you. ohh! My bad Christopher..! And Great review Ron ! Thanks 🙂 I checked out Sixth Sense, looks great. Thanks for sharing it. £3.99 – slightly more when you work out exchange rates, but still a good deal don’t you think? I not sure I got it. After you scan the cards can you search for it on your phone by let say typing any information writing on the card – like business name, name etc. or it just being kept as picture? Not a bad app for those money, but they need to fix those glitches. You won’t always be in a brightly lit room when you scan a card. Yep, that’s true. Lighting seems to be a factor, but thats not too bad, it performs well to be honest. Christopher : The idea of this app is simply marvelous. It will make life a lot easier for those of us who have a wallet full of business cards and at times we just can’t find the one we need. It seems to have some flaws, but I’m sure that it will be 100% working in a couple of months. I’ve been to a couple of networking events recently, and the amount of business cards I’ve received when I go is definitely worth getting something like this… I got SO tired of putting everyone’s information in my phone!! Thanks for your comment, welcome to the blog. Then it seems you might need this app Kayla, try it out & share your comments here.